Ray is well known for his insight into Jewish/Biblical culture. He has a great collection of resources (Books/DVD/audio) which look at the geography and culture of 1st century Israel giving amazing insights into the World of the Bible. This particular series explores the cultural implications of Jesus as a Rabbi, and what the rabbi-disciple relationship would have looked like. Vander Laan introduces you to the humanity of Jesus the Rabbi, shows us what would be expected of a Disciple–challenging us to step up to the plate striving to be good disciples–and drops in some incredible insights into the Biblical Text as he reveals some Jewish teaching techniques masterfully utilized by Christ. I will give a caution along with my recommendation. While I love the content and insight, don’t take it as gospel. A lot of what he says is verifiable, but sometimes he makes jumps that are difficult to verify. There are conjectures and theories put forward in a way that makes them sound like fact, but occasionally they are not as sure as he makes them sound. 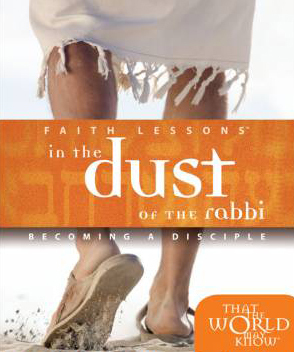 Regardless, his work is incredible, and this series will challenge you to walk so close to Jesus that you’re “covered in the dust of your rabbi”. (Once you’re done with this series, pay a visit to http://www.followtherabbi.com for a bunch of other free audio).